We often host weekend brunches as a way to see our family and friends. I love entertaining and cooking for others! We typically make something with eggs, so if it's not this absolutely scrumptious frittata, it's this frittata or a shakshuka (the latter is a recipe in my third cookbook coming out later this year!). And that's not a typo, I meant to say frittata twice ;) I love frittata recipes! I find that eggs are always a crowd pleaser and it ensures everyone is full because they are packed with protein and good fat. 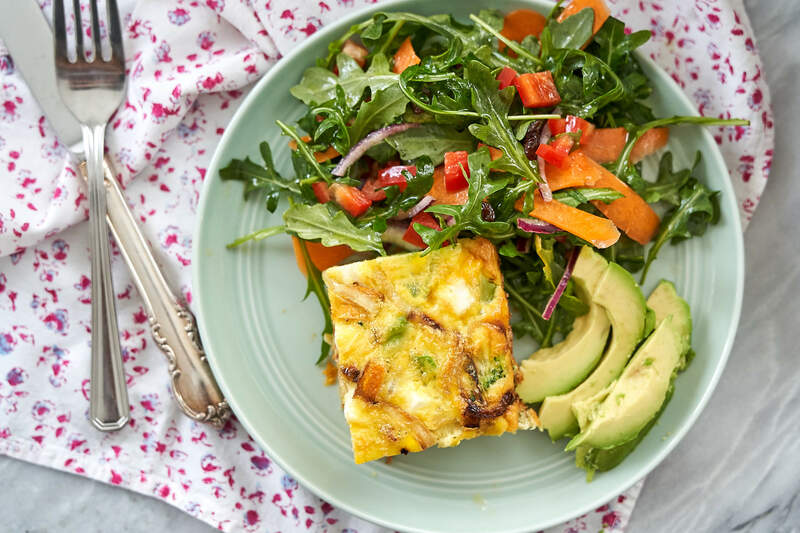 As you might have read recently on social media, I'm a salad gal at breakfast which is why you see my frittata accompanied by a ton of colourful veggies! I know that might sound weird, but don't knock it till you try it! You'll be happy to know, this can be an easy weeknight dinner recipe too. 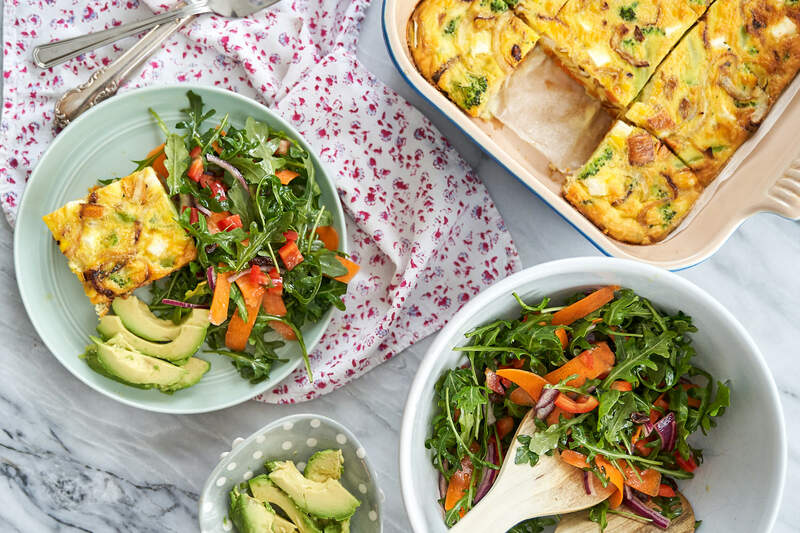 For this delicious frittata, I served it with salad, avocado and a sourdough baguette. I often serve an eggy brunch alongside these delicious Cranbery Walnut Breakfast Muffins. If you haven't tried them yet, you must! 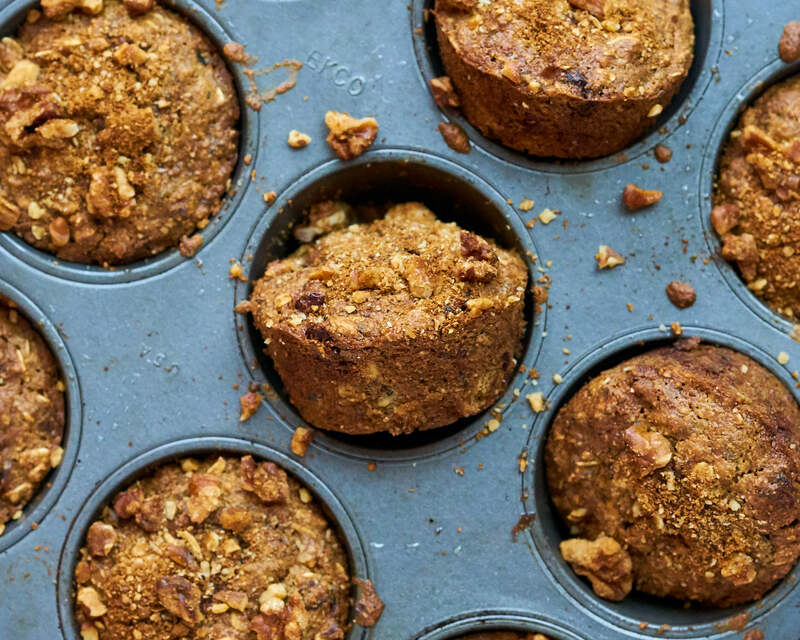 They are a perfect muffin to pair with this breakfast. 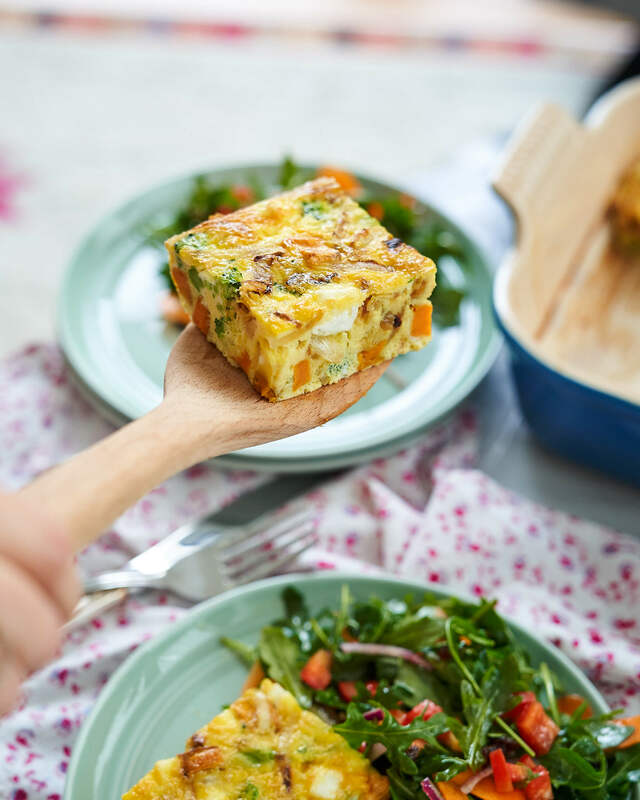 I've talked about the health benefits of eggs (like immunity boosting ) before so I will skip it this time and instead tell you how much goodness is packed into this frittata – and when I say packed, I really mean it! When you're adding the ingredients, it's going to seem as though you've got more ingredients than eggs. 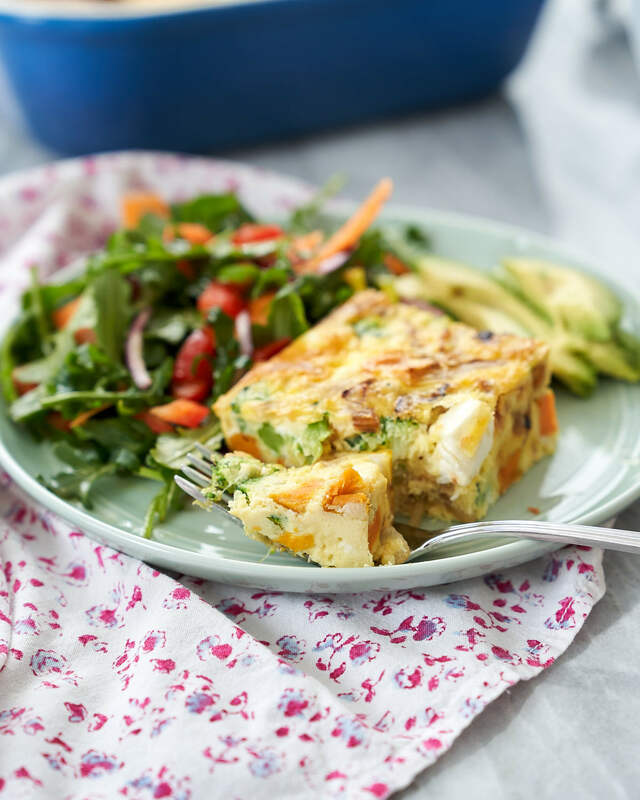 While this may be true, once it bakes, the eggs will rise and you'll have a meaty, thick, flavour-packed, filling frittata. The combo of the soft roasted sweet potato with the salty dense texture of the feta is pure magic! 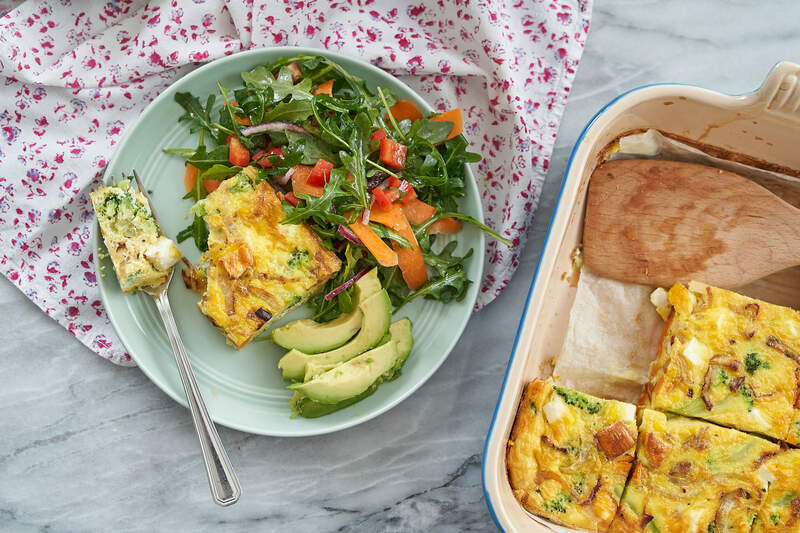 If you're not serving a bunch of people, this frittata will keep for a few days so you can refrigerate it and easily reheat it for a quick and healthy lunch or dinner. I recommend baking it at 350 degrees F (180C) for 10 minutes. When adding onions to your frittata, it's a critical step to saute them first so they get a little caramelized (almost a touch burnt). 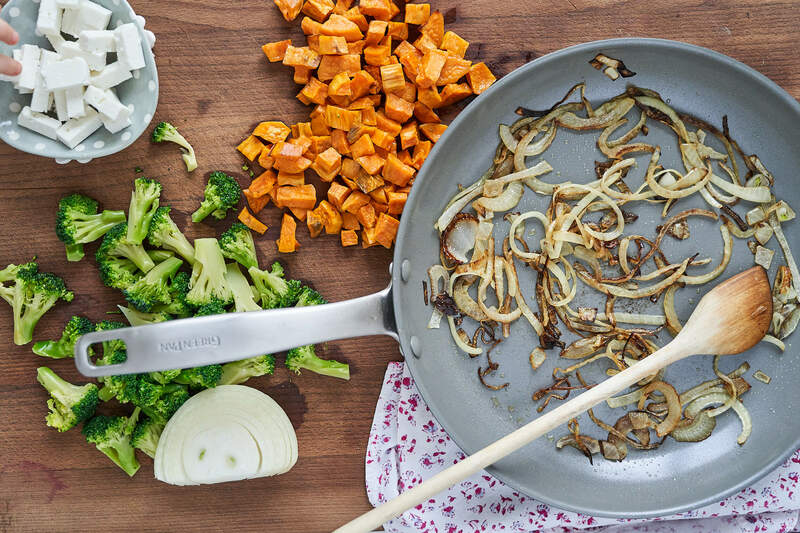 Even though you can technically skip this step, because the onion will cook as the frittata cooks, you won't want to – trust me! They become gloriously sweet and so much more flavourful when you cook them prior to adding them to the frittata mixture. I almost always roast the sweet potato ahead of time, like the day before, so that step is already done when I'm ready to make it. It usually takes about 30 minutes to cook in total so it's super easy to pop it in the oven when our guests arrive. 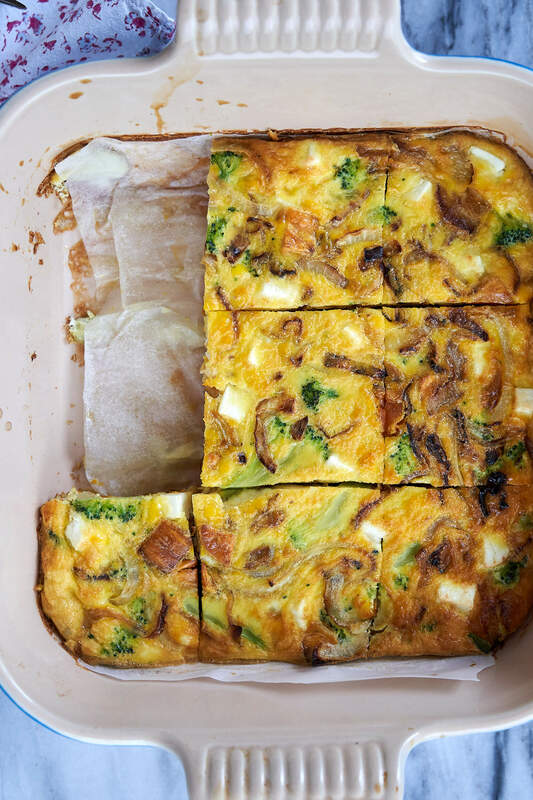 Even though Vienna actually hates eggs, for some strange reason she will eat this frittata – but scrambled, poached, hard-boiled, fried – forget it! I think it's likely because it's packed with foods she loves like broccoli and sweet potato. This is not your traditional frittata where you put everything into an oven safe cast iron skillet and then place it in the oven. The eggs don't go in until you're ready to put everything into the baking dish. I always do my frittatas this way, not the traditional way. 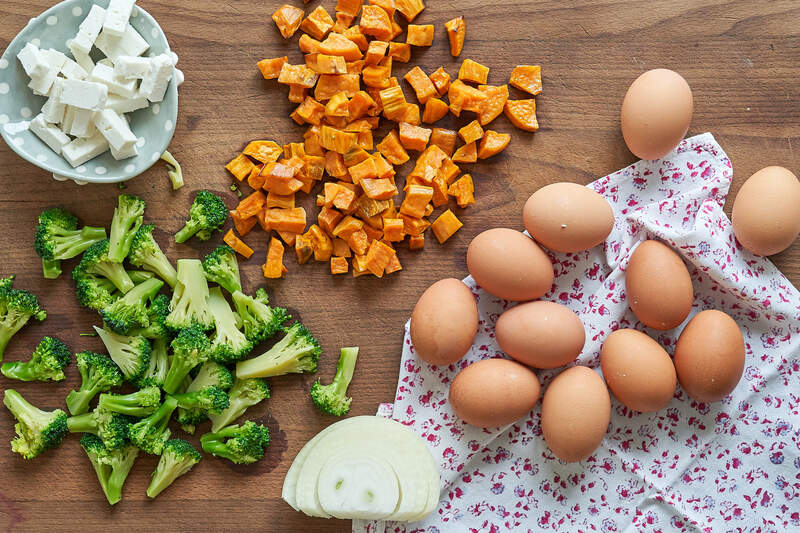 Without further ado, here's my delicious recipe for Broccoli Sweet Potato Feta Frittata! It is gluten-free (by default) and free of cow-derived dairy since I used goat-based feta which is typically easier to digest. Whether you're making it for a weeknight dinner or brunch with friends, I am confident you're gonna love it! Preheat oven to 350F (180C). Grease or line a 10x10 ceramic dish or glass pan with parchment paper. In a large fry pan, heat olive oil and sautee onion until soft and lightly browned. Let cool before combining with egg mixture. 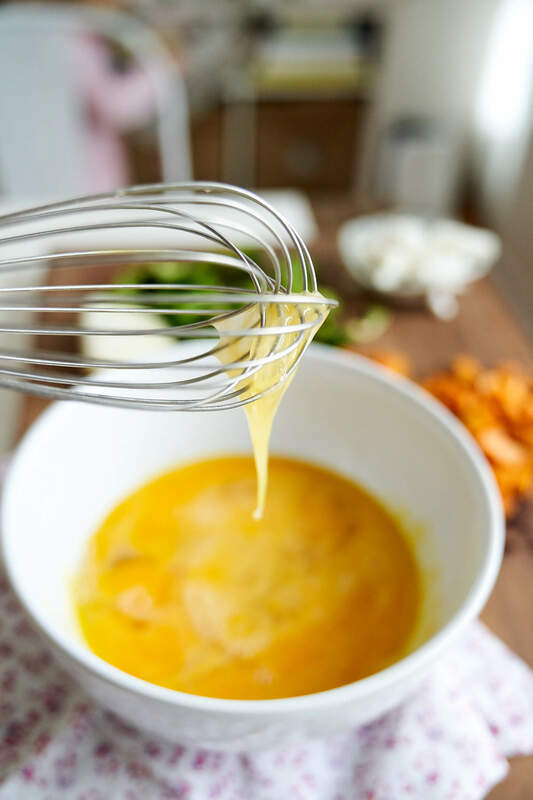 In a large bowl, whisk together the eggs and milk. I used oat milk. In a large baking dish (I used a 10x10) ceramic dish, pour the egg mixture. Season with garlic, salt and pepper. Bake for 30 minutes or until the centre is fully cooked and there are no jiggly wet bits on the top. The top should be a nice golden colour. Let cool for a few minutes before slicing into desired sizes. Serve with your favourite hot sauce and your favourite sides! Serves 4-6. I make this all the time when we are entertaining. It feeds 4 adults and 2 kids well. If you've got a couple of sides then you may be able to serve 6 adults. *I used frozen broccoli that I poured hot water over top to quickly thaw so they were very lightly cooked from the hot water. As I'm writing up this post I am munching on leftovers with a salad (obvi). 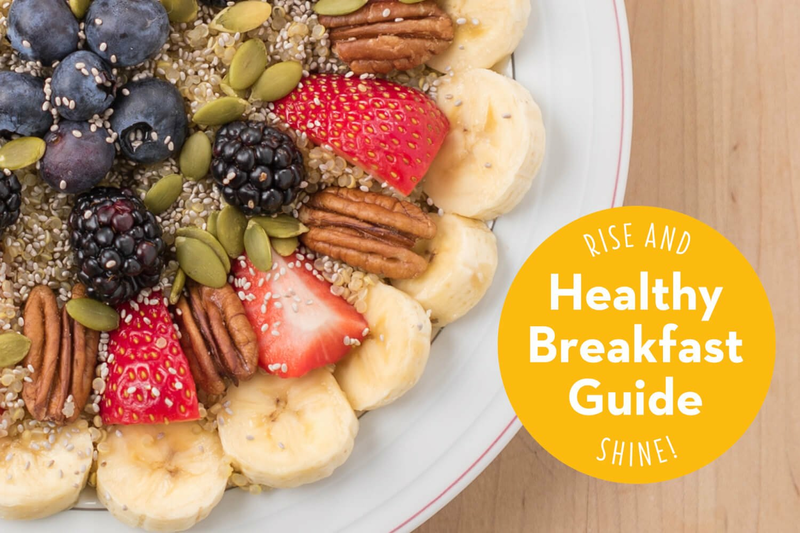 I know, I know, not mindfully eating but I am so excited for you to try this one out! Weeknight meal here we come, I'm excited to try this as I love frittatas. Do these freeze well? I don't typically freeze it because I'm not sure how well the eggs would reheat, but that doesn't mean it won't work. If I'm making it just for 3 people we always have leftovers but they are gone within a few days. Thank you! I make frittatas often but will make this one this weekend for the fam to try something new. Yes could kale or spinach instead of the broccoli for some green foods! Yellow onions are sweeter and white onions have more bitter properties. The level of prebiotics, starches and phytonutrients will differ from one type of onion to another so that's probably the reason you react to one and not the other because they are just not the same. However, I can't say for sure exactly why this is happening but it's great you've identified which onions work for you and which don't. Thank you! Made this with the spinach sub and it was fantastic. We also made a few batches of the carrot cake cookies (I just reduced the maple syrup a bit and added some milk) and my kids gobble them up. 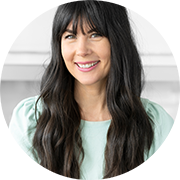 Thanks for the fantastic recipes and healthy inspiration. So glad to hear both recipes were kid-approved! :) My pleasure, thanks for the comment! This recipe sounds like another winner, will be trying it tomorrow - thanks Joy! I am in love with your Cranberry Walnut breakfast muffins and like to mix up two batches of dry ingredients at once, and bag the 2nd so that its an easy bake on a 5 am weekday. I live in Michigan but discovered your Joyous Detox cookbook last year at Indigo bookstore in Toronto when visiting my son at Ryerson, and you have been such a great inspiration to me ever since! Keep up the great work! I’ve been making this for years, I usually have left over roasted veggies in the fridge and if I have leftover fish or chicken, I cube it and throw it in as well. I guess you could say it’s my Leftover Frittata. I mix everything in a bowl and then pour it into a large Pyrex pie dish and it turns out perfect every time. We have it for breakfast, lunch or dinner. Loved this recipe but added some extra spice since my husband hates sweet potatoes, Dean loved it and thought the sweet potato was ham. Win win. Can’t wait to make it again!